Paul Atkins is a lecturer at University College Birmingham teaching creative media. His research focuses on identity and representation in Welsh media. Whilst there were few surprises in the Culture, Welsh Language and Communications Committee’s report into Welsh radio, the inquiry under the leadership of Plaid Cymru’s Bethan Sayed AM has been much bolder than the Welsh Government in asserting the role of the Assembly in regulating the sector. For some time, the UK Department for Culture, Media and Sport (DCMS) have been pursuing a policy of deregulating the radio industry. Whilst some of these reforms, such as relaxing the rules on music formatting, are sensible and pragmatic attempts to reduce to burdensome bureaucracy, others, such as the proposal to reduce the number of approved license areas and the changes to the minimum number of locally-produced hours, could have a potentially devastating impact on local commercial radio in Wales. Particularly on the provision of local news. It has long been acknowledged that Wales suffers from a serious democratic deficit when it comes to coverage of important areas of devolved policy such as education, health and economic development. One of the key recommendations in the report is to support Ofcom’s Advisory Council for Wales’ call for an ‘All-Wales News’ provision on commercial radio and to make this a licensing requirement. “As well as possibly resulting in job losses, as companies take the opportunity to centralise production, there could be a detrimental impact on rural communities, with larger towns and cities being chosen for more centralised production”. The removal of such licensing requirements has long been popular with the commercial sector, with both Communicorp and Global supporting DCMS proposals to relax this requirement, their argument being that localism should be judged in terms of content, not production location. However, this vague statement perhaps illustrates the main issue faced by Welsh Government – without any specific competence over issues of broadcast regulation, it can only recommend that Ofcom look at the issue. Currently, the minister has no powers to draw up legislation or instruct Ofcom and it is not clear that the DCMS regard ownership and plurality as key policy issues at this stage. Perhaps the most ambitious and interesting section of the report relates to community radio. This is an area in which the Welsh Government could have some impact, if not through broadcast regulation, as much as funding and economic incentives. As the report points out, the take-up of community radio licences in Wales is relatively low – this is due to a number of factors, notably restrictions on commercial income (which the report recommends the UK government ‘reconsider’) and problems securing the operating costs required to keep stations on-air. 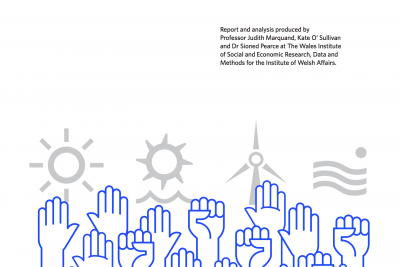 Of the sixteen recommendations the report made, five relate to community radio directly. The first recommendation suggests evaluating and possibly reinstating the Welsh Government’s Community Radio Fund (ended in 2014). There is also a vague recommendation to publicise the availability of the Community Radio Fund currently operated by DCMS. Unfortunately, this fund is already oversubscribed and releases comparatively small funds, mainly for the purpose of supporting fundraising/business development activities. “organise a symposium for Community Radio stations in Wales to provide an opportunity for them to get together and consider a range of common issues, including use of RAJAR ratings services”. The most striking recommendation comes out of evidence given to the committee by the University of South Wales’ Steve Johnson, which suggests that the Welsh Government and other public bodies support the community sector by placing more public information campaigns and government advertising within the sector – this was an idea rejected by the minister as ‘dangerous’. Whilst the report suggests that in general DCMS need to more to encourage DAB (Digital Audio Broadcasting) coverage in Wales, the committee seems to be concerned that DCMS should not take a decision about a digital switchover until Wales’ ‘relatively poor digital’ coverage is addressed. Refreshingly, the report acknowledged the ‘virtual monopoly’ held over DAB broadcasting by DAB multiplex owner Arqiva – a situation which makes DAB broadcasting all but impossible for small or community operators. However, there was no mention of the possibilities of small-scale DAB in the report. Piloted in England by Ofcom, scale-scale DAB multiplexes (or Mini-Muxes) allow for many more stations to broadcast to smaller, more localised transmission areas for a fraction of the price of coverage on commercial multiplexes. It was interesting that this, potentially revolutionary technology was barely mentioned in the report. You can read Ofcom’s report on the Small-Scale DAB multiplex trial here. It is clear from the report that the committee regards Ofcom’s current BBC operating licence as offering a ‘lack of challenge’ and suggests that BBC Cymru Wales should be more assertive in ‘promoting news stories from Wales and Welsh music for the UK networks’. The report also calls for an increase in ‘the volume of news and current affairs coverage on Radio Wales and Radio Cymru’. Reading between the lines, the report is critical of both the current approach of DCMS and the lack of ambition from the Welsh Government. The report correctly suggests that the Welsh Government are lacking in strategic direction in this area, however, this would have been more convincing if the committee had been more explicit in its support for broadcast devolution or at least some degree of competency in this area.